Hopefully you’ll all be aware of a recent Kickstarter campaign for a new Dreamcast game, Intrepid Izzy developed by Senile Team – best known for Beats of Rage and Rush Rush Rally. From the moment the Kickstarter launched, I thought that Intrepid Izzy looked like an incredibly promising addition to the Dreamcast’s library. 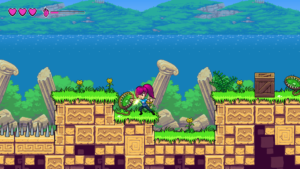 Something we haven’t seen too much of in the way of Dreamcast titles, Intrepid Izzy is a 2D platformer with a bit of a Kid Chameleon twist, where Izzy can unlock different costumes, which give her new abilities. Well, Senile Team has kindly sent us an updated version of their demo – a very early build of the game to showcase some of its features and gameplay – allowing us to preview the game and bring you our first impressions of this ambitious title. From the off, Intrepid Izzy hits your audio senses with a pretty damn awesome theme tune, before you even enter the game. It reminds me of the good old days, where soundtracks were incredibly catchy and matched the pacing of the gameplay and the environments around you. The music continues brilliantly throughout, suitably changing as you enter new areas and the environment around you differs. Right now, it seems some of the audio effects missing, such as enemy sounds and object noises – but as an early example of the game, I’m really impressed with the audio. Visually, I really like where Intrepid Izzy is heading. 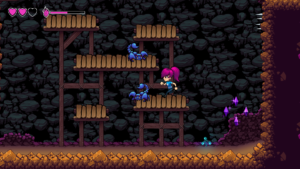 I’m not sure how much more work is going to be done on the game, but it all looks very solid, with crisp, bright graphics and great animation, especially for Izzy. One comment I would have in terms of graphics is that the game is currently missing some of the more advanced, finer touches you might find from non-indie games, such as lighting effects and shading. However, this is an indie game and even if those are missing from the final product, the game does look great, with some decent effects, such as dancing flowers and a sparkling ocean in the background. 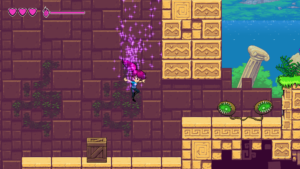 In terms of gameplay, Izzy controls beautifully, with tight controls that lend themselves well to the platforming sections and the game’s combat. Unlike many traditional platformers, such as Mario or Sonic, Izzy is a badass with her fists and feet, using them to beat up the game’s monsters. Perhaps leaning on their previous venture with Beats of Rage, Izzy can pull off a series of combos, ending in an incredibly satisfying uppercut. In terms of the fighting, the controls are simplistic, requiring users to simply tap either X or B to punch and as she lands hits on enemies, she will automatically perform combos. 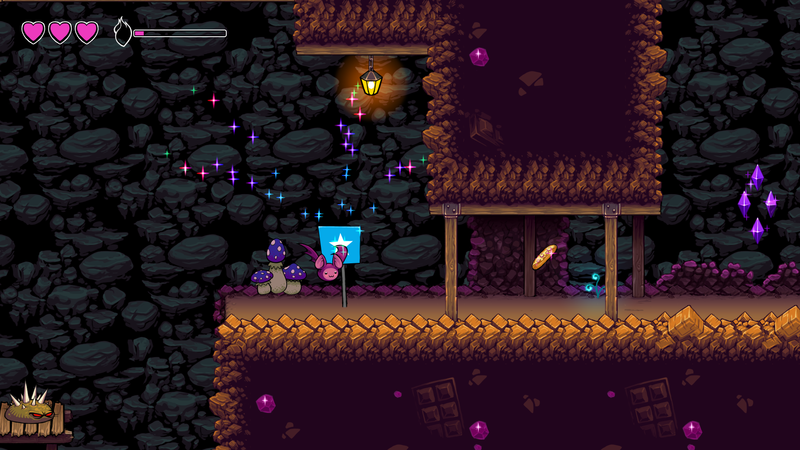 Throughout the game, you pick up little, pink gems which fill up an energy gauge at the top of screen. Not going to lie (you can see it in my video, above) I didn’t realise what the purpose of the gauge was until about halfway through my playtime. Essentially, in Izzy’s standard costume, by pressing the Y button, Izzy can perform a powerful fireball attack. 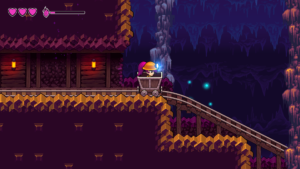 There is one minor complaint that I do have about the platforming in the game though – which is judging where Izzy will land. Izzy often seems to over-shoot where you might think she’ll land from a jump or drop from a platform. Watching my video, you’ll see myself die several times from this. But, that said, I found I could adjust Izzy’s movement in the air just enough to prevent her from over-shooting platforms – so it is avoidable. As mentioned, Izzy is also able to pick up new costumes, giving her new abilities. In the demo I found one new costume, a vampire outfit, which gives Izzy the power to transform into a bat, allowing you to fly to new areas and explore further. Using your costume’s powers though will quickly deplete your energy bar, so be sure that you’ve stocked up on those pink gems. 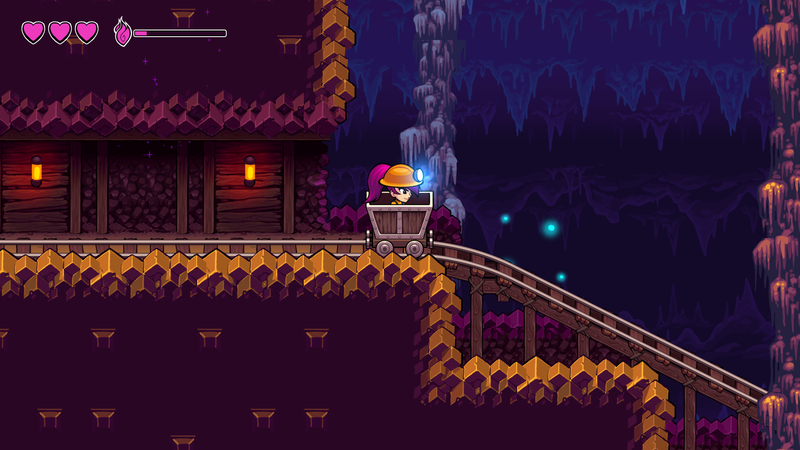 Aside from mixing gameplay styles up a bit with the costumes, there are sections of the game that steer away from platforming, such as riding a mine cart, trying to avoid, spikes and columns of octopuses (yeah, you read that right), and pick up gems. 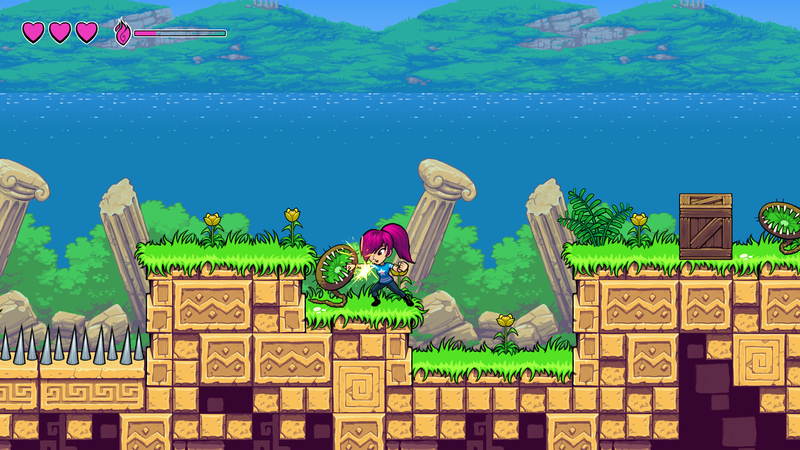 Overall, I’m really impressed with Intrepid Izzy and even at this early stage, the game is shaping up well. I cannot fault the game’s soundtrack – it’s brilliant, catchy and fits perfectly with the environments I played through. 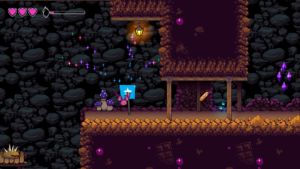 The visuals are solid and even if they do end up missing out on the fancier effects you might see from the bigger developers or indie games on modern platforms; ultimately Intrepid Izzy looks great in its current state. There’s the minor annoyance of over-shooting platforms when jumping/falling, but it’s something you can get used to and/or I’m hoping Senile Team will consider adjusting come the final release. But overall the game’s controls are tight and the gameplay is spot on. 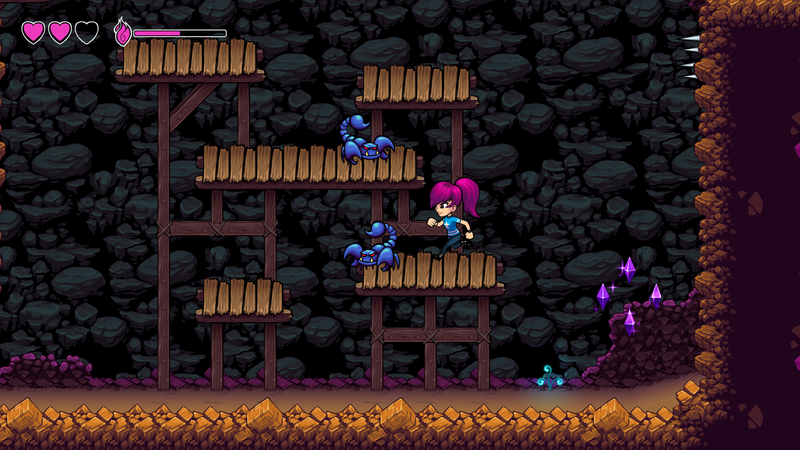 Intrepid Izzy has just the right amount of challenge and intrigue that I enjoy from platforming games. I’m looking forward to seeing the final product and more of this game in action. Intrepid Izzy is being developed for the Dreamcast (the version I played), PS4 and PC. If you like what you’ve seen/read, please support the development of the game and back Senile Team’s campaign on Kickstarter, here.